Wolf Connection® is truly blessed to have attracted the most amazing team of people one can wish for. These are the people that make Wolf Connection possible. Please take a moment to meet them. 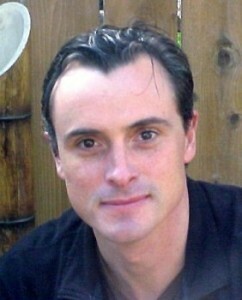 Originally from Argentina, Teo moved to California in 1999. He comes from a family lineage of educators and legislators who have supported youth development in his native country. Embracing those values, and in line with his own caring nature, Teo developed a passion to reach out to young people in need of mentoring and guidance. After three years in the army, Teo became a rock climber and adventurer. As such, it was natural that his first mentoring experiences involved young people joining him on mountaineering and outdoor exercises. The goal of these programs was to offer a rite of passage experience that would help kids and families gain a sense of confidence and accomplishment. Once in California, Teo simultaneously spent 10 years under the tutelage of senior instructors at Cleargreen, Inc., and 4 years with Mind Works, Inc. under the mentorship of its founder Master Business and Personal Coach Larry Pinci, PhD. Teo is part of the Cleargreen, Inc. team conducting self-discovery seminars around the world. He is the visionary of various youth and education programs designed to support teens and young adults in their mid and long term goals, creating a community of inspired young men and women… a new generation of leaders. Over the years, he has been a court advocate with the CASA program, a registered foster father, a trainer for the Safe School Ambassadors program, a mentor and a life coach for adolescents and young adults. In his private coaching practice, Teo has specialized in working with boys from various social backgrounds, guiding them into a constructive dialogue in order to express themselves and find ways to deal with their personal life challenges. Teo has been working with young men and women, and their families, since 1996, and with captive exotic animals since 2002. Giulia was introduced to Wolf Connection® by coming to the monthly community hikes in September 2010. When she learned that the organization’s mission was primarily centered on nurturing the development of youth/adults while integrating the animal and nature experience, she knew that she had found her heart’s desire. Starting as a volunteer, Giulia sensed that the many elements of her education and work/life experience were converging to create a new life path. A language major with plans of law school, Giulia worked as a legal assistant in New York City focusing on environmental law who then went on to receive her Master’s Degree in Counseling Psychology. With a continued interest in Native American culture where wolves are revered as great teachers, she brought her talents, knowledge and interests to the development and growth of Wolf Connection’s programs. Leading programs, heading Human Resources, and managing volunteer growth prepared her for handling the overall operations of the organization. Becoming Wolf Connection’s® COO is a partnership between Giulia and her willingness to learn, explore and grow into emerging opportunities. The message from the wolf spirit and conservation of the land: Leave room for unknown dreams and take positive action, all in sacred timing. Wolf Connection® gives Cate the opportunity to combine her passions of promoting healthy child development, creating safe communities for children and families to prosper, and teaching through adventure education. Her lengthy background in the non profit sector and practice as a behavior modification specialist with at-risk youth, as a juvenile justice advocate in the legal field, winning the Philadelphia Bar Association’s Law Student Outstanding Award, and as a civil rights instructor at Camden High School in Camden, New Jersey, the most dangerous city in America, is a unique combination of excellence in compelling writing, expertise in For Change fiscal responsibility, and a deep appreciation for the true heroes who make Wolf Connection® a reality… the donors and supporters. As Director of Development, Cate’s goal for Wolf Connection® is to become a trailblazer in For Change fundraising and a gold standard organization that inspires future dreamers, pioneers, and inventors to work towards a better tomorrow, just like the incredible people who make up the Wolf Connection® Leadership Team. 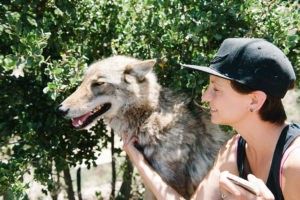 Amanda’s longing for a more creative, experiential approach to human growth and empowerment, as well as a synchronistic move to Los Angeles, led her to Wolf Connection. 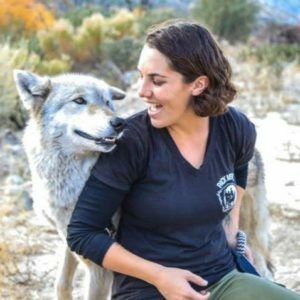 Amanda is a licensed psychologist and educator, and at Wolf Connection® she collaborates with the wolf pack and human program team to facilitate powerful opportunities for awareness, connection, healing, and growth. Amanda earned her PhD in Counseling Psychology from the University of Illinois at Urbana-Champaign, and her clinical training and experience has focused on multicultural competence, group interventions, and mindfulness-based approaches to wellness. At a post-doctoral level she has engaged in intensive training focused on psychological trauma and healing. Amanda has been actively involved in teaching and research throughout her career. Consistent with her commitment to social justice as a therapist, she has presented and published a number of empirical studies focused on social, cultural, and training issues (e.g., inmates’ experiences, White privilege, multicultural learning environments, etc.). Amanda is deeply honored to work in an environment where in-the-moment experience and willingness to learn from the wolves and the land surpass any of her aforementioned credentials. As Lead of Animal Behavior, Renee oversees the socialization of the rescued wolfdogs and general caretaking training for volunteers. She collaborates with the volunteer coordinator to ensure that volunteers and staff are following safety procedures and are consistent with animal and human interactions. 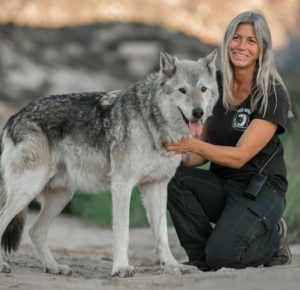 Renee also works with the Lead of Programs by facilitating the animal/human connection to maximize Wolf Connection’s® programming. Renee’s natural talent for understanding animal behavior began early in childhood with horse training along with managing the family’s several canines, cultivating her innate knowing. This intrinsic skill granted Renee acceptance to Moorpark College’s Exotic Animal Training and Management program with continued hands-on medical experience as a veterinary technician. 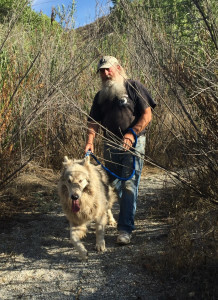 Near the completion of her studies at Moorpark, she met Teo Alfero and the initial pack of wolfdogs that changed her life. 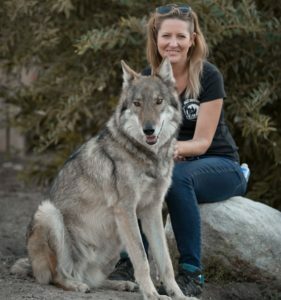 Renee is an integral member of Wolf Connection’s® Leadership Team, whose knowledge and presence leads the Pack Services Department with great strength now and into the future. 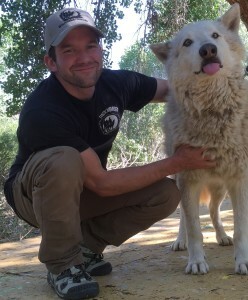 Initially drawn to Wolf Connection® because of the rescued wolfdogs, Kyle volunteered alongside the amazing staff and volunteers to learn more about Wolf Connection’s® mission to serve at-risk humans through re-connection to nature. Kyle joined the Leadership Team in 2017 as Lead of Business Development and Partnerships. Drawing on over 12 years of business development experience, having practicing consulting and relationship management in both the financial and technology industries, Kyle’s goal at Wolf Connection® is to broaden its reach. By developing increased partnerships with businesses and corporations and by introducing Wolf Connection’s® programming to Los Angeles County’s school districts and youth organizations, Wolf Connection® can empower more human beings to actualize their potential and become stewards of the earth. My wife Brenda and I have been wolf advocates in Alaska for years so when we arrived in Acton and heard the distant howling of a wolf-pack we knew we had to find them. After searching, we found Wolf Connection® and have been there ever since. Not a day goes by that we don’t count our blessings for being able to work with these amazing animals, care for them and learn from them.